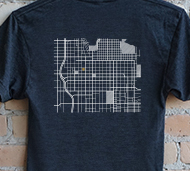 Our annual holiday edition of T-shirt swag for clients and friends went out last month featuring another testament to our love of downtown. Our eightman logo identifies our location, but you can test your geographic familiarity of other area features, from Liberty Park to the Capitol Building. We’ve got a few for sale in our online store.